Soon after the end of the war, Weston made two journeys to the United States. In August 1919, he was to be found at the British Embassy in Washington DC, “On duty to the US Navy” . He stayed for just 2 weeks. When his next trip began is unclear but on 25 March 1921 he was returning to Britain from the US aboard the Panhandle State . On passenger lists he is found to be travelling first class and as a naval officer, and on his 1919 voyage his British contact address is “Air Ministry” . It is clear that his business was official. What Weston had in mind was the creation of one of the world’s earliest motor caravans (aka campervans, motorhomes, RVs). 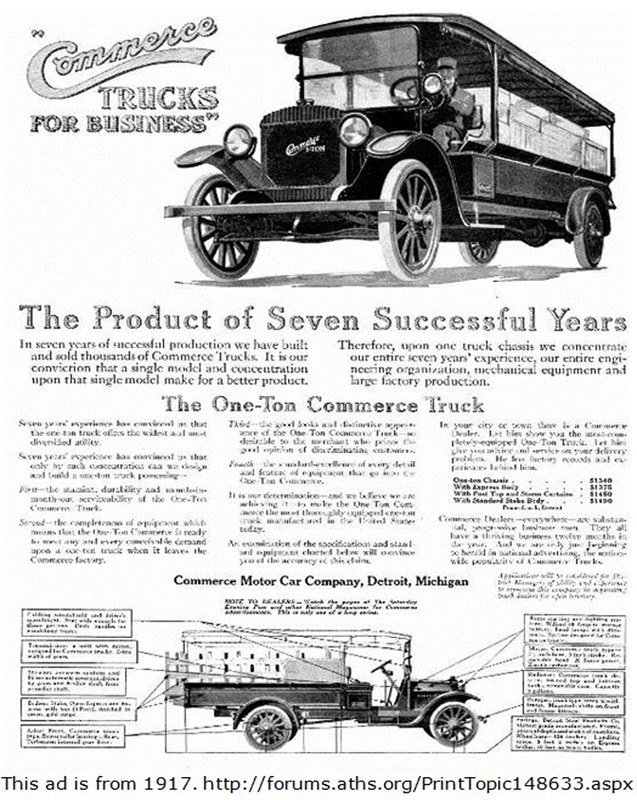 To that end he shipped the chassis cab to Britain and was largely responsible for the design and conversion of the finished vehicle. The project took six months  and the motor caravan was named Suid Afrika . 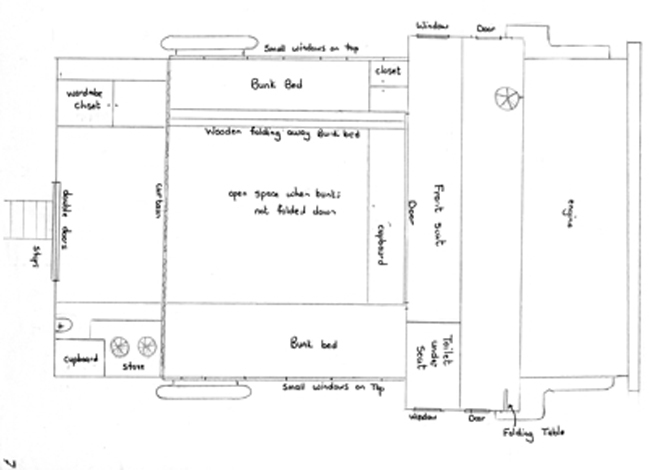 The completed motor caravan was dominated by the rectilinear, boxy cube which housed the living quarters. This dwarfed the relatively tiny front end which consisted of the hooded engine compartment and two wheels. The ‘house’ walls had few windows, whilst the front end had a large expanse of glass. The sides of the lantern (or saloon) roof, which rose a little above the main roof line, were made up of several opening lights . 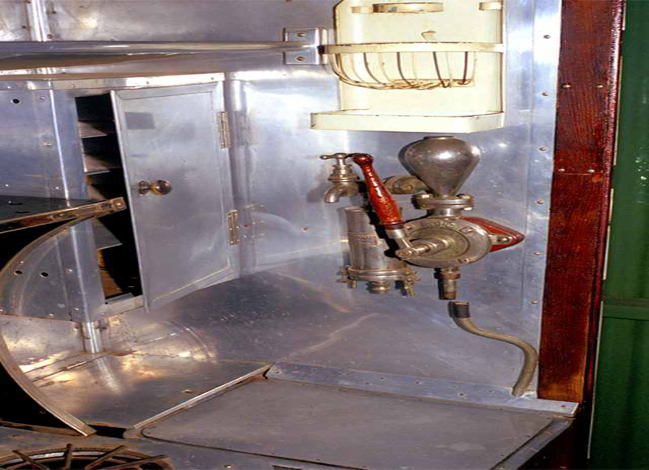 The rear of the vehicle was the entrance to the ‘house’ and inside, on the right, was the kitchen which contained a hob consisting of two petrol burners, a copper sink and a pump drawing water from a tank below. 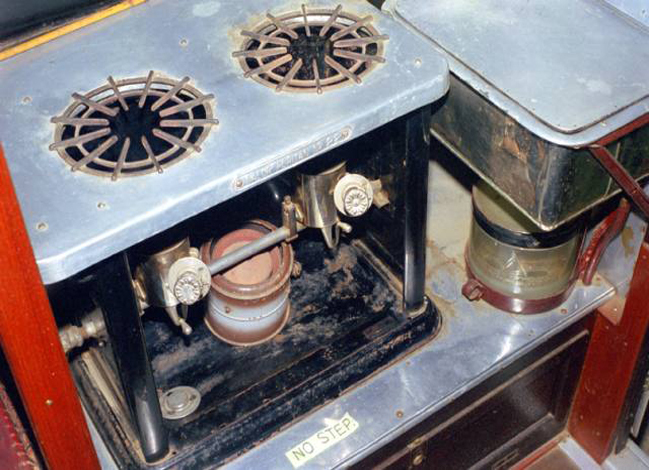 An inline filter meant the pumped water was passable if not potable: boiling was necessary before drinking. On the opposite wall were lockers and a wardrobe. 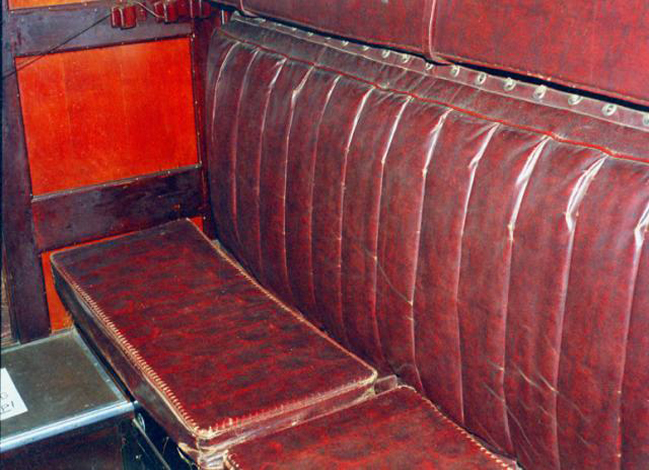 Forward of this area the interior resembled a railway carriage with padded leather upholstery. In the day, this assembly functioned as seating: at night it became four bunk beds. 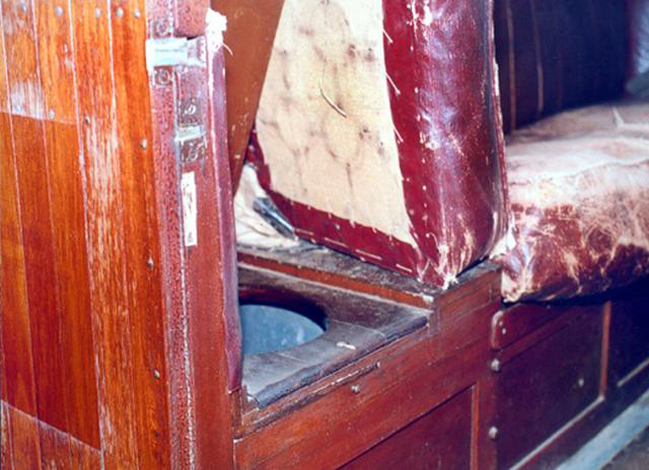 The fifth member of the family slept across the cab, which could be accessed from the rear or from the front side doors. In the middle of the ‘railway carriage’ was a table which had its own storage location when dismounted and folded up . Lighting and space heating were provided by oil lamp . The vehicle carried “a whole week’s supply” (16 gallons) of fresh water  and could carry more if necessary . It could also carry more than 100 gallons of fuel: its consumption was 5 miles per gallon . 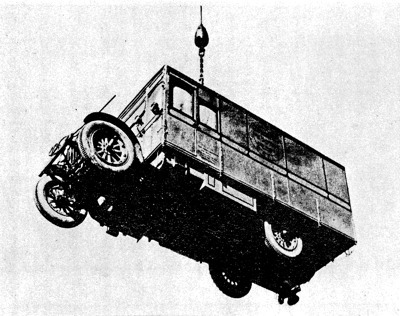 The vehicle weighed in at 4 tons . 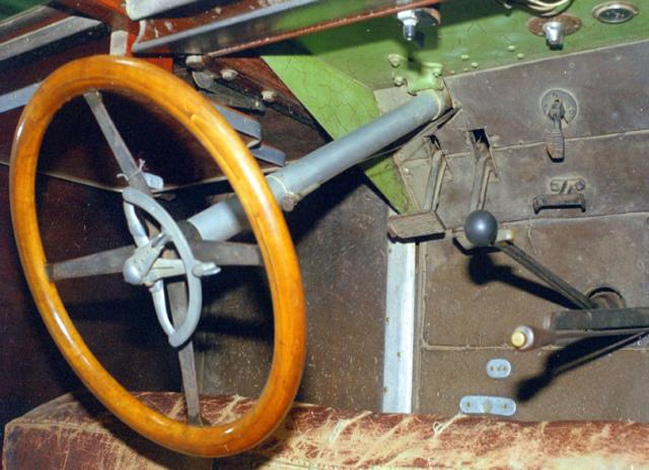 A startling feature of the design was “a special four-leg sling which passed through a trap-door in the roof and the four legs then pass through smaller trap-doors in the floor, two legs being connected direct to the rear axle and two to the chassis frame just behind the front axle” . This allowed the vehicle to be “lifted bodily without disturbing its contents”  and a photo exists of the vehicle being craned on to a ship using this facility . The sling says it all. Suid Afrika was literally extraordinary. It was not just another “motor home” or “house car” of the time . 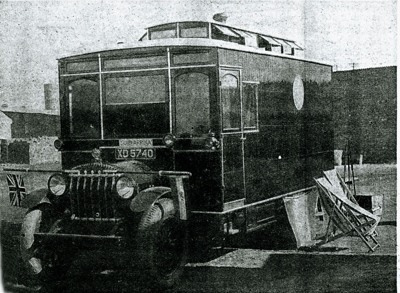 It was built to be an expedition vehicle, for long-distance travel on the most testing of tracks. In his book Home on the Road, Roger White tells the tale of early motor homes in the USA (and therefore in the world at that time, ~1910 onwards) and whilst there were remarkable vehicles that had to endure the most primitive of road conditions, nothing he describes had the vaulting ambition of the Weston caravan . The wider purpose of Weston’s project made it even more remarkable. It was not simply to facilitate his lust for travel – though he certainly had that – but to give “practical expression” to “his large, but healthy, idealism”. “To travel from land to land, to mix with the people of all nations…, to speak to them and hear their views, to study their institutions and their customs, that is his aim” . On the side of the yellow, black-lined vehicle was a disc with the inscription ROUND THE WORLD encircling a pithy, progressive manifesto . There was in addition “a more immediate purpose in [the] undertaking, a bold experiment in the education of his children… He wishes them to see the world, to be freed from the narrowness and prejudices of those who grow up among never-changing surroundings, who know nothing of life beyond the pale of their dorp [village] or city, the beauties and the grandeur of the earth, or of the nations and races who people it, and adorn (or mar) it with their works. He is preparing them to be citizens of Planet Earth” . However, Weston was still employed in the military and still held his posting to the British Naval Mission to Greece. He decided to travel back to Greece with his family and initially, it appears he did not envisage an overland trip. An old German friend who had died had left him a large yacht. Weston imagined sailing the yacht with the motor caravan lashed to the deck: “The idea was to travel inland with the caravan from a port of call when sailing around the world” . When the conversion was completed the family travelled around Britain after which, sometime in 1921, they proceeded to Harwich where Suid Afrika was driven on to the deck of a cross-Channel ferry and shipped to Belgium. From Antwerp the family drove to the mouth of the river Scheldt where the yacht was anchored. There they trialled the boat, only to discover that Mrs Weston was a bad sailor! It was reluctantly decided to dispose of the vessel and to drive overland to Greece. The journey would last four and a half months . Their route took them south through France, down the Rhone valley to the Mediterranean coast. From there they struck eastwards, crossing the Po valley into modern day Croatia and down its coast, probably as far as Dubrovnik from where they drove north-east into Serbia then south through Kosovo, Macedonia and into Greece. It seems probable they came to rest in Athens where the family were to reside for two years . The 1923-24 return journey from Greece to Antwerp involved passing through Bulgaria during its September 1923 revolution . 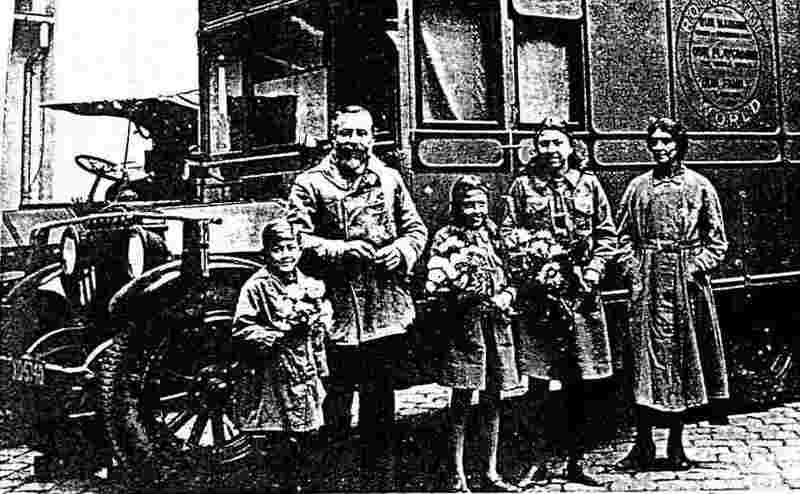 The Westons then drove through Romania, Hungary (the photo shows them in Budapest on 6 November 1923), the modern day Czech Republic where they were snowed in for six weeks and Germany where they stayed for three weeks and where the vehicle was repainted. By the time the vehicle arrived in Berlin it had 12,000 miles on the clock . In early May 1924  the Weston family, along with the Suid Afrika, left Great Britain  (or Antwerp? ) for South Africa aboard the Adolf Woermann. The date of Weston’s return was in part motivated by financial considerations: he was “To be demobilised w/e from 22 11 23 (Required to sail for S Africa by 22 5 24 in order to obtain repatriation benefits)” . 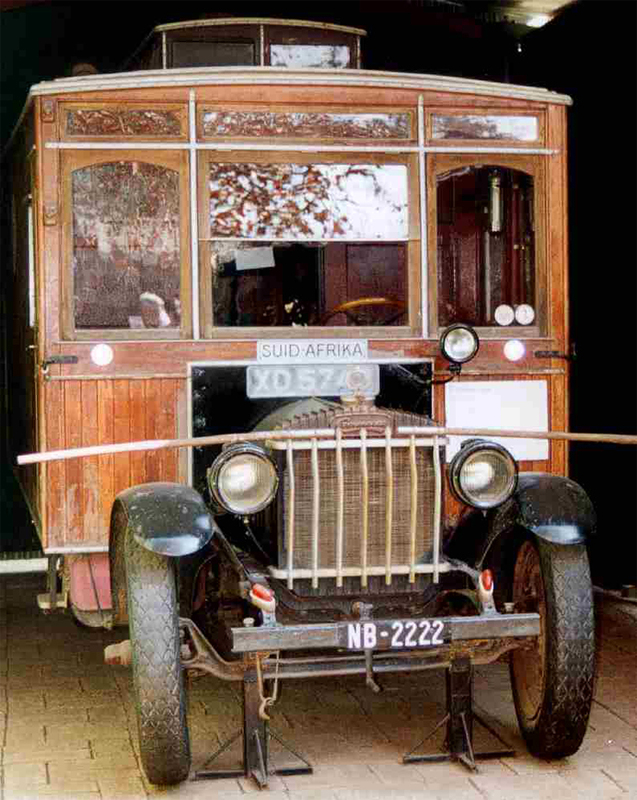 In Brandfort Weston changed the wooden body of the caravan to a “lath form because of the damage inflicted on the first body by narrow streets and rifleshots by brigands in the Balkans” and in 1925 extensive travels were undertaken in southern Africa . In 1924 Weston had declared that, after the European adventure, his intention was to travel to North and South America and then to the Far East , but by 1926 this seems to have been forgotten or to be on the back burner. It was time for the children to further their studies in England and they were asked how they wished to travel to London – by air, sea or overland. The unanimous vote was for travelling overland . The Trans-Africa journey was begun in 1927, leaving Bloemfontein and heading north . However, the family soon found that their vehicle was too heavy and too bulky to negotiate the rivers, pontoons and narrow paths through bush country. It seems likely they discovered this from hard experience, though The Caravan Story  implies that they might well have been advised by others that the route ahead would prove impossible: “The condition of the roads and tracks were such that this route was more aptly known as the ‘Great North Rut’!”. 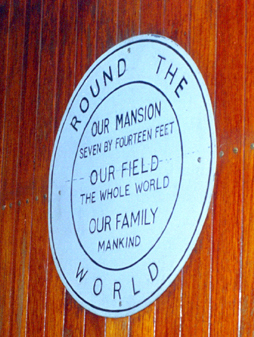 They turned back to Cape Town where it appears they had a property, though the Brandfort house was not sold until April 1928 . Weston began work on a new body which was canvas covered and which the family called the Prairie Schooner after the iconic wagon used by 19th Century migrants overlanding westwards across the USA . The canvas was stretched over a wooden framework and the ‘house’ made waterproof so that it could be floated across rivers with the baggage and equipment inside, whilst the truck itself was dragged through with the aid of a winch . Weston claimed that “The body can be taken off the chassis in ten minutes” . The Trans-Africa journey finally got under way in 1931, contrary to one otherwise full and apparently accurate account which cites 1930 . 1931 seems correct because “In June, 1931, The Star reported that the Weston family had arrived in Johannesburg by motor caravan en route to Cairo” , and an article in the Egyptian Gazette dated 24 February 1932 reports the presence in Cairo of a “highly original and interesting family… [in] perfect health… [and] deeply sunburned”, having just arrived overland from the Sudan . The four year delay in departure was partly due to the time spent on re-developing the vehicle but also to Weston’s absence overseas . 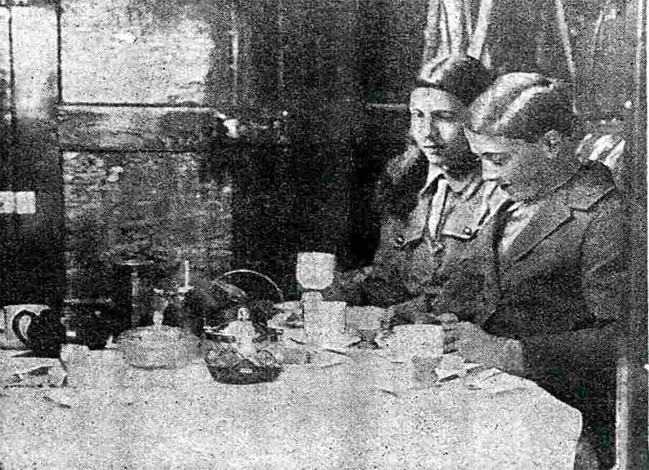 There are few records of these trips though there is evidence that he had been in Britain in 1926 – on 17 July “Rear Admiral John Weston” sailed first class from Liverpool to Cape Town on the Euripides  – and it has also been said that in 1928 “Weston’s mother and sister Lucy died from cholera in China where they were doing relief work” and that “John went over to China to wind up their affairs” [47A]. There is no definitive evidence of this Far Eastern journey but Weston was certainly on a Japanese ship from Durban to San Pedro (ie Los Angeles), arriving in December 1928 [47B], and this is the only trans-Paciific trip by Weston for which we have information. It seems quite possible that he went onwards from the US west coast to China (via Japan?). Cape Agulhas [South Africa] > Kimberley [South Africa] > Johannesburg [South Africa] > Bulawayo [Zimbabwe] > Livingstone [near Victoria Falls, Zimbabwe] > Lusaka [Zambia] > Broken Hill [now Kabwe, Zambia] > Abercorn [now Mbala, Zambia] > Tabora [Tanzania] > Arusha [Tanzania] > Nairobi [Kenya] > Tororo [Uganda] > Kitgum [Uganda] > Mongalla [South Sudan] > Kodoc [Kodok, South Sudan] > El Obeid [North Sudan] > Omdurman [North Sudan] > Khartoum [North Sudan] > Atbara [North Sudan] > Abu Hammad [Abu Hamad, North Sudan] > Aswan [Egypt] > Luxor [Egypt] > Cairo [Egypt] > Suez [Egypt] > Beersheba [Be’er Sheva, Israel] > Bethlehem [Palestine] > Jerusalem [Israel/Palestine] > Jericho [Palestine] > Amman [Jordan] > Damascus [Syria] > Antioch [Turkey] > Aleppo [Syria] > Adana [Turkey] > Angora [now Ankara, Turkey] > Scutari [now Üsküdar, Istanbul, Turkey] > Constantinople [now Istanbul, Turkey] > Sofia [Bulgaria] > Belgrade [Serbia] … after which point the map from which these place names are taken is silent . Even in the 21st century this journey would be extraordinarily ambitious and demanding in a modern vehicle with modern communications. Without proper equipment and serious preparation it might even be foolhardy. It was all the more ambitious because it appears Weston planned to travel, in midwinter, beyond the Arctic Circle to Nordkapp! In Cairo, Weston told a reporter that “the great, bleak northern plain is… extremely rough and dangerous to vehicles except in winter… [The snow] thaws slightly during the day and then freezes hard at night and… by continual building up… forms a hard level surface [which] can be used as a road” . “The difficulties encountered in traversing the African continent in those years were manifold and sometimes enormous. The crossing of rivers, for instance, was a problem which varied from one river to the next. Great ingenuity was often required. Sometimes a whole village of a hundred or more natives were needed to drag the caravan through a river and up its steep bank. Sometimes the caravan with all equipment and baggage could be floated across and sometimes pole bridges had to be used, but these often had to be re-inforced [sic] before the hazardous crossing could be dared. In the swamp areas a careful route had to be plotted to avoid fever-ridden regions. The existing tracks in the forests in elephant country often had to be opened up first and cleared of the fallen trees where elephants had played. These tracks seldom ran straight or in the desired direction and therefore careful navigation by compass was very important. The Sudd country in the upper Nile regions was a special obstacle to overcome. [Also known as the Bahr al Jabal, As Sudd or Al Sudd, this is a vast swamp in South Sudan, formed by the White Nile. The term ‘sudd’ has come to refer to any large solid floating vegetation island or mat. The area which the Bahr al Jabal covers is one of the world’s largest wetlands ]. The weight which could be supported by the ground varied so greatly that safe routes had to be found before an attempt could be made to move the caravan. The greatest test for the reliability of the vehicle was presented by the Nubian Desert [south of Aswan and Abu Simbel and now in North Sudan]. 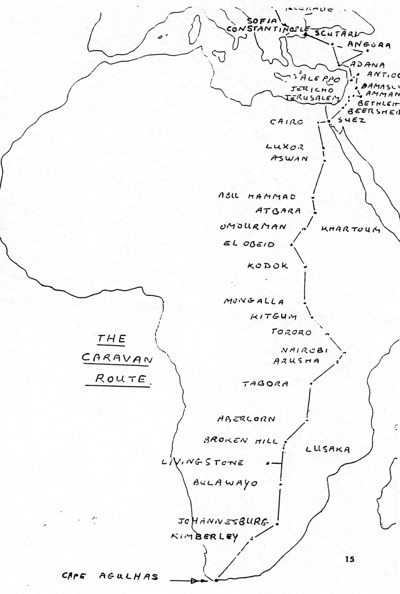 As it was impossible to travel anywhere in the neighbourhood of the Nile because of the topography of the country, the desert had to be traversed at such a distance from any source of water it would have been quite impossible for the members of the expedition to abandon their vehicle in case of any trouble and attempt to reach water on foot. After traversing the Nubian desert the hope of finding easier travelling conditions was not realised, as the Sinai desert proved to be almost as difficult as the Nubian” . “It can be stated without reservation that the indigenous people encountered on the African continent were all friendly and helpful, though often very frightened of the monster they could not comprehend. Hostility, as by marauding bands of bandits, was only encountered in Asia Minor and actually on the European continent ”. “Emir Said [probably Emir, or Prince, Said al-Jazairi who led the interim government formed in Damascus in September 1918, after the last Ottoman troops left  and remained a prominent figure thereafter ] was informed of the approach of the caravan and its inhabitants. A guard of honour on beautiful white Arabian horses came to greet the travellers outside Damascus and led them to the palace. The relaxation of the travellers and their enjoyment of the amenities of the palace – especially the cool fountains – after the long desert travel can be imagined” . It seems possible that the palace where they were entertained was Abdelkader in which the al-Jazairi family continued to live until 1948 . Reality was to strike soon after. “It was in the mountains of Anatolia that brigands became a threat to the travellers who had to be ready with their rifles to ward off any possible attack”, and unfortunately “The trip to the North Cape had to be abandoned, at least temporarily, since the academic year was due to start soon” . What followed immediately afterwards is sketchy, though there seems no doubt that England was reached and that John Weston returned to South Africa in 1932 as he was reported to be in his home country in October “on a short business trip” and, on an unspecified date, in Eastern Cape Province on a trip to Durban “by caravan” . So the motor caravan too had returned home and there it would stay. Used by Weston until his death, it was stored and then re-built according to its original Suid Afrika design. In 1975 it featured in the International Veteran and Vintage Car Rally from Durban to Cape Town and later was donated to the Winterton Museum, KwaZulu Natal, South Africa, by Weston’s son in law, Carl Rein Weston  . It can still be seen there in all its glory as the photo atop this page shows. Click on the image below the word OVERLANDING to share the author’s passion for overland travel in a motorcaravan. From a border crossing document dated 8 September 1919: Weston entered the USA via Canada. Reference: United States Border Crossings from Canada to United States,1895-1956, database, FamilySearch (https://familysearch.org/ark:/61903/1:1:X59C-R3L : accessed 16 October 2015). John Weston, 09 Aug 1919: from “Border Crossings: From Canada to U.S..1895-1954. database and images. Ancestry(http://www.ancestry.com : 2010); citing Ship Minnedosa.arrival port Quebec. England. line 12. NARA microﬁlm publication M1464, roll 375. NARA record group 85. National Archives and Records Administration, Washington D.C.
 White, Roger B. Home on the Road: The Motor Home in America. The Smithsonian Institution. 2000. Ibid. The vehicle’s colour and ‘look’ was to change later. Anon. The Caravan Story op cit, Anon. A Modern Voortrekker op cit, and Oberholzer op cit. A.D.N. (author’s initials). Cape Agulhas to North Cape. Across Africa and Europe by Car. The Weston Family Expedition.